Listening to music, as basic as it sounds, brings a big deal of positives into whatever we are doing. For example, if you need to stay awake in the morning, a dose of heavy metal should do the trick. Feeling a bit down? How about an upbeat song like Daft Punk's "Get Lucky" to shoo the melancholy away? In need of motivation to beat that looming deadline? Play Europe's "Final Countdown" and let it energize you better than a can of Red Bull. And while you're at it, why not use the kind of devices that will upgrade your soundtrip sesh for an even better audio experience? With titanium-coated diaphragms and 40mm HD driver units, Sony's h.ear on headphones set produces crisp and clear sounds with minimal unwanted vibrations. It also boasts high-resolution audio compatiblity as well as accurate bass response for top-notch audio reproduction. And, with a folding mechanism, you can tuck away these cans neatly to reduce space and potential damage to the device. Definitely man-bag friendly! If you want to go smaller, Sony's h.ear in NC earphones might be right up your alley. Don't let its size fool you, though; these buds can also produce quality high-resolution audio, thanks to 9mm high-sensitivity driver units inside, which deliver clearer, more accurate tunes. But the best thing about the h.ear in NC is its built-in, battery-powered active noise-canceling tech, which lets you immerse yourself in pure audio bliss minus unwanted outside noise. Another sweet in-ear audio device, the h.ear in earphones is housed inside an aluminum shell which helps lessen vibrations that can otherwise ruin the audio experience. Couple that with other nifties such as 9mm high-sensitivity driver units (for quality hi-res sounds) and the Beat Response Control feature (for improved bass sounds) and you've got a gadget that will pamper your ears. Who says PMP (portable media/music players) are dead? Sony's NW-A26HN Walkman sports an improved digital amplifier to play more dynamic tunes, as well as the DSEE HX upscaling technology, which enhances compressed audio files (e.g. .mp3). This bad boy also comes with Bluetooth connectivity, so you can listen to your songs wirelessly and 32GB of internal capacity for your audio files. But just in case that's bitin, a microSD slot is served for your additional storage needs. 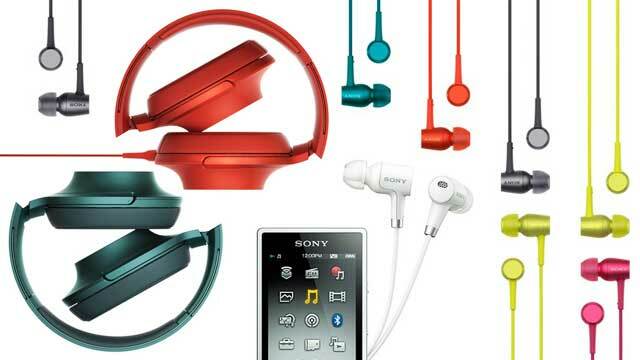 Get it: P14,999 (32GB) via select Sony Centres nationwide. There's also a 16GB variant (A25) which goes for P5,500 less.